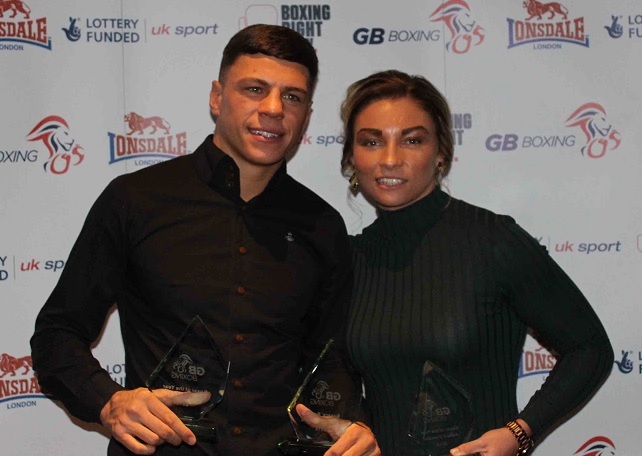 Pat McCormack and Lauren Price scooped top boxing awards in Sheffield. Lauren Price has been named best female boxer at GB Boxing’s Annual Awards Evening in Sheffield. The Newport fighter was the unanimous choice of the judges after she won medals at the World Championships, European Championships and Commonwealth Games where she struck gold. Birtley ABC’s Pat McCormack scooped the trophy for Best Male Boxer, voted by the GB Boxing coaches, and the prestigious Boxers’ Boxer of the Year award, following a successful 2018, which saw him win gold at the Commonwealth Games in Australia. Price took an historic gold for Wales at the Commonwealth Games in the Gold Coast last April. Then she wen on to become the only female boxer from the GB Boxing squad to win a medal at both the European and World Championships in 2018, winning a bronze at each. Lauren Price on her way to Wales’ first boxing gold at the Commonwealths in April. Pic: Getty Images. The 24-year-old was narrowly beaten 3-2 by reigning European champion Nouchka Fontijin in the semi-finals of the worlds in India last month. Price and McCormack were presented with their awards by GB Boxing’s Performance Director, Rob McCracken and 2016 Olympic bronze medallist, Joshua Buatsi. McCracken said: “Pat and Lauren are very deserving winners after their stand out performances in 2018. “It is a pleasure to give the award to Lauren after an extraordinary year in which she has announced herself on the world stage. “She has performed superbly throughout the last 12 months and, in my opinion, could have come away with more from the World Championships where I felt she was unlucky not to get the decision in her semi-final against a hugely experienced opponent.